The calibration of the Multizone Control (MZC III) zone board is simple and straightforward. 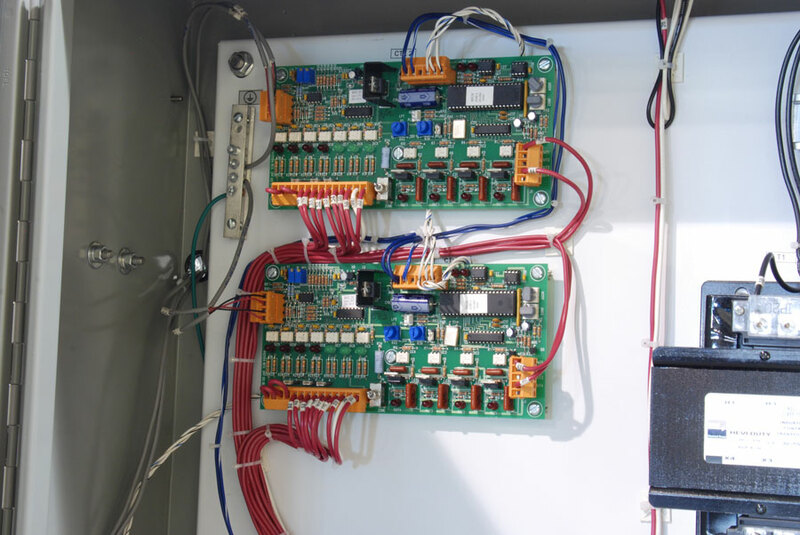 Typical placement of Zone Control boards in central water chillers. 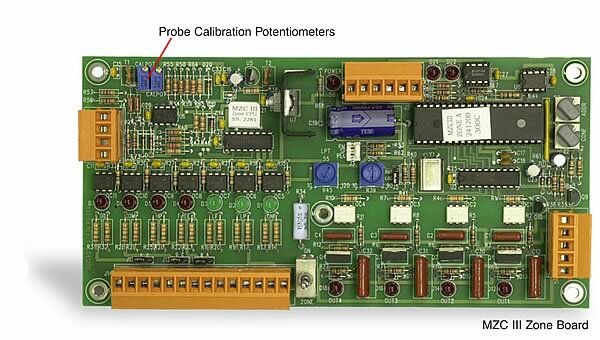 Each probe circuit has a single point calibration potentiometer. The procedure is to know the fluid temperature that the probe is in and adjust its pot to reflect that temperature. Calibration can be accomplished by turning the chilled water set point up so that all compressors are off. Then, place the sensor from a known temperature measurement device into the chiller tank and use this temperature to calibrate the probes following the procedures in steps 2-4 below. An ice bath as the known temperature also works well by calibrating to a spare probe, if you have one. The probes are interchangeable to +/- 1.2°F. In the upper left hand corner of the zone board you will find (2) multi turn pots. The left one (labeled CALPOT) calibrates the Evaporator In probe (Ei1 on the MZC III instrument display). The right one (labeled CALPOT 1) calibrates the Evaporator Out probe (Eo1 on the MZC III instrument display). To calibrate the Zone 1 probes, from the MZC III display, press the Zone button until the 'Zone 1" LED light is flashing. Then press Select until 'Ei1' is displayed. Use a small, non conductive screw driver to adjust the calibration screw on the multi turn pot until the display's temperature matches your known calibration temperature. Make adjustments slowly! The temperature value is averaged over time and there is a small communication lag due to the scanning process within the MZC III instrument. Once the Ei1 probe is calibrate, press Select until 'Eo1' is displayed and repeat the procedure. Repeat these steps until all probes in all zones are calibrated. For more information about MZC III controller and zone board calibration call the Advantage Sales Department at 317-887-0729. Would you like to Download FYI #285 to your browser?